MOSCOW, Idaho – Idaho’s first goal when it opens the football season against Fresno State Saturday is to introduce doubt to the Bulldogs. FSU is coming off a 10-win season and Mountain West division championship. It expects even more in coach Jeff Tedford’s second year. The Bulldogs rolled Idaho 61-14 the last time the two played in 2013. They own the series 11-4 and have won the last 10 meetings. The Vandals must convince the Bulldogs this isn’t going to be another cakewalk. And throw some wildcat at them. Idaho has been practicing the formation all week, in which a running back takes a direct snap. It adds a blocker in the ground game against a stout Bulldogs front seven. In addition, it gives FSU’s trio of outstanding linebackers – Jeff Allison, James Bailey and George Helmuth – something new to have to cover. Petrino said flooding the field with five-receiver formations won’t take FSU’s linebackers out of their game, although Idaho might try some of that, too, and maybe a double pass. But the Vandals may force them to play out of their comfort zone. Idaho’s offense will also test new FSU defensive coordinator Bert Watts. He replaces Orlondo Steinhauer, who is now the assistant head coach of Hamilton in the Canadian Football League. “They have the same (defensive) package, but will they call it with the same personality?” Petrino asked. Idaho knows Steinhauer’s tendencies after FSU gives up a long play or suffers a turnover. “We’ve got to get a feel for them as the game goes on,” Petrino said. 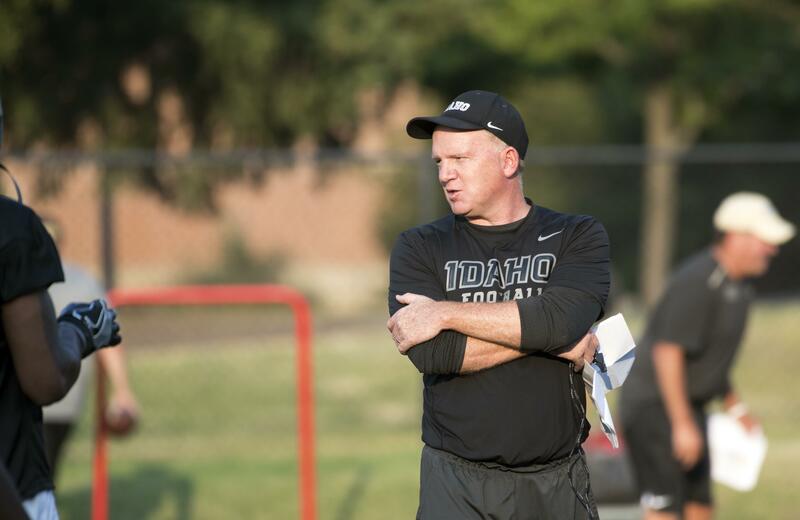 Idaho will use two quarterbacks, junior Mason Petrino and sophomore Colton Richardson. Both started games last year. They bring disparate skill sets: Petrino is the better runner and Richardson has the bigger arm. Paul Petrino said in fall camp he would not shy away from alternating them on plays within a series if it appears the Vandals can get an advantage against the defensive personnel in the game. The quarterbacks will throw to a pair of veterans in David Ungerer and Kaden Elliss and newcomers such as Cutrell Haywood, Connor Whitney, D.J. Lee, Brandon Luckett and Jeff Cotton. Whatever he does on offense, Elliss will probably still be more valuable on defense. He is a next-level pass rusher off the edge, and he pairs well with fellow senior linebacker Ed Hall, who picked off three passes for Idaho last year. The Vandals must disrupt Bulldogs quarterback Marcus McMaryion. The Oregon State transfer went 9-4 last year for FSU in his first go-round running Tedford’s offense. The Bulldogs also like to go deep. They completed 54 passes of 20 yards or longer. McMaryion has 1,000-yard receiver KeeSean Johnson and Oklahoma transfer Michiah Quick as major targets this season. A key to success for the Vandals will be preventing FSU from regularly getting big plays on first downs, Petrino said. “I think there was one day when I was upset with the intensity and effort,” he said of fall camp. Now he wants to see that preparation produce momentum, against FSU and throughout the season. Published: Sept. 1, 2018, 5 a.m.